Day 01,02 and 03 - Upon arrival at Udaipur airport transfer to Castle Bijaipur (02.30 hours by road) for 3 nights stay. P.S. : Trekking in nature, jeep safari, cycling, bird watching, village walk and many more exciting activities can be arranged by hotel travel desk. Day 04 and 05- Leave for Udaipur (03 hours). Upon arrival transfer to Jagat Niwas Palace hotel for 02 nights stay. Known as the “City of Lakes”, here you can savor the spectacular lake views from boat rides and experience the vibrancy of local market and explore the tall tales of the city at its various Palaces. Day 06 - Leave for Mount Abu by bus (Dep at 0830 hrs and Arr at 1230 hrs). Upon arrival check in at Jaipur house for 02 nights stay. Day 07- Day at leisure. Leave for an overnight hike (rocky loose scree). The hike will cover 26km of walk and panoramic views, rock formation, grazing fertile plateau, and flora & fauna. The sloth bears are among the common habitat of the sanctuary. Discover the fascinating Dicliptera Absences, endemic plant species and two species of wild roses Rosa involucrata and Rosa Moschata. Day 1 - Explore the Mt Abu town in a 30 minutes drive to the highest peak of Aravali Hills and off to nature. Day 2 - After breakfast enjoy the 1400 meter descending meandering and steep downhill zig zag. Things to bring: Sunscreen lotion, head lamp, warm fleece, hat, walking boots, long trousers, and neck tube. Day 08- At 1400 hrs- Transfer to Village Bhanswara (03 hours). Upon arrival check in at Ravla Bhanswara for night stay. The place is known for its vivacious village life and jeep safari. Day 09 -Leave for Khuri Village, Jaisalmer (06 hours). Upon arrival check in at the authentic village house of Badal Singh for 3 nights stay. Accommodation is inclusive of homemade food cooked by your host family. 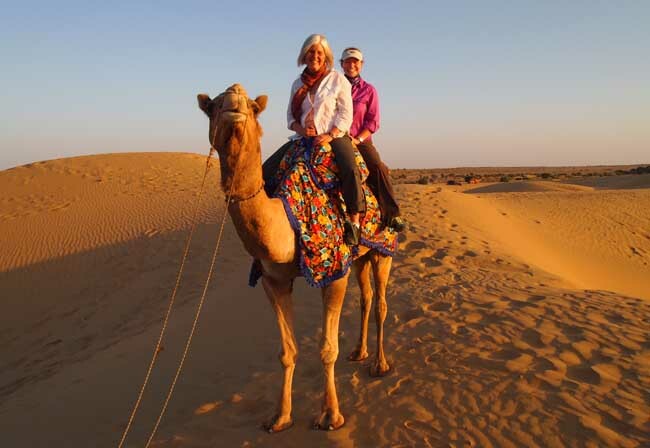 Day 10 - Leave for overnight camel trek to step back in time and enjoy the simplicity of the desert life. In the evening, get a real chance to savor the view of the stars and sleep on the dunes. Trek is inclusive of breakfast and meals, and everything is arranged by your host. Day 11–After experiencing myriads of flavors of desert through a camel trek, we will return to Badal Singh’s house for night stay. 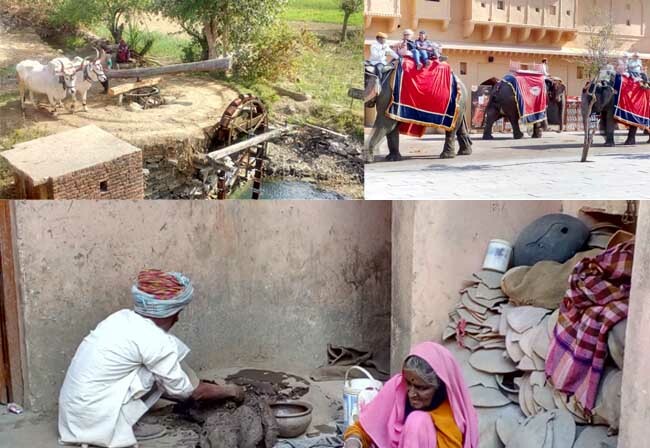 Day 12- Leave for Jodhpur (06 hours) Via Jaisalmer to explore the picturesque Fort and Havelis in the town. Take pleasure in exploring Jodhpur’s proud, the impregnable and majestic Mehrangarh Fort and continue for the night stay at Indrashan “Home Stay Accommodation”. Day 13 -After breakfast, leave Jodhpur to enjoy a fun-filled train journey to Jaipur (Dep at 0930 hrs and Arr at 1530 hrs). Upon arrival, we will arrange a car from the railway station to Arya Niwas Hotel for 02 nights stay. Day 14 – Jaipur, also known as the “Pink City”, is a major tourist destination in Rajasthan. It has worth visiting places like the majestic Amber Fort, City Palace Complex, Jantar-Mantar, and the Palace of Wind. Elephant rides to the city and guided tour can be arranged by hotel travel desk on a prior notice of one day. Day 16- In the morning, Safari by a shared Jeep. Day 17- Leave for Agra (05 hours). Upon arrival check in at Mansingh Palace for night stay. Day 18 - Morning session Agra tour to catch the avid glimpse of Mughal Architecture at the world famous Taj Mahal and Agra Fort. In the afternoon leave for Agra Cantt station for the journey to Delhi (Dep at 1545 hrs and Arr at New Delhi at 1905 hrs). Upon arrival check in at Ahuja Residency for night stay.